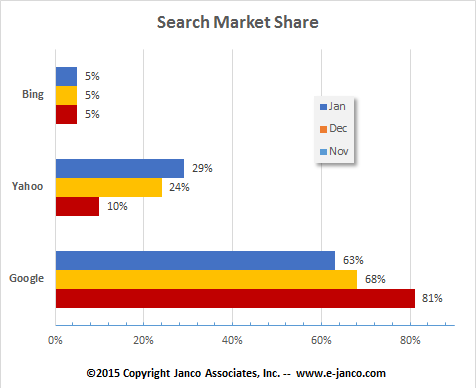 The Browser Market Share and Operating System Market Share White Paper data is by month starting in September 1997 through May 2015. The data sampled is internationally based (Just under 50% of the data points sampled are outside of the United States). 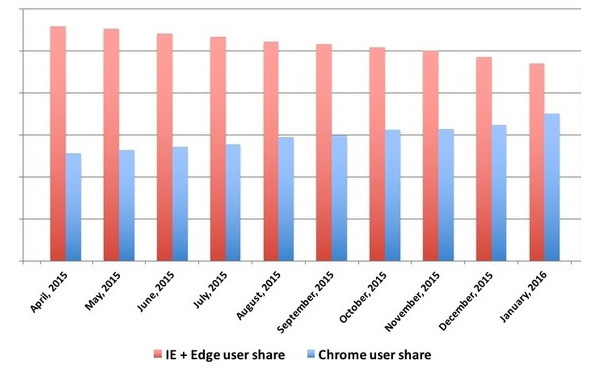 After almost two years, just over 1 in 5 Windows 10 users are using MS Edge as their browser. Much of the reason for its non use is the way the product is designed. In addition few extensions that are available in Mozilla's Firefox an Google's Chrome have not or cannot be implemented on the Edge Browser. 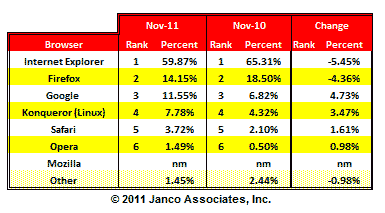 Microsoft (according to Net Applications is soon to fall from its number one spot in the browser market. There are more Google searches that take place on mobile devices than on computers in 10 countries including the US and Japan. In addition when you look at the data for the number of unique visitors (see chart below), it is clear that tablets and Smart Phones are taking over. 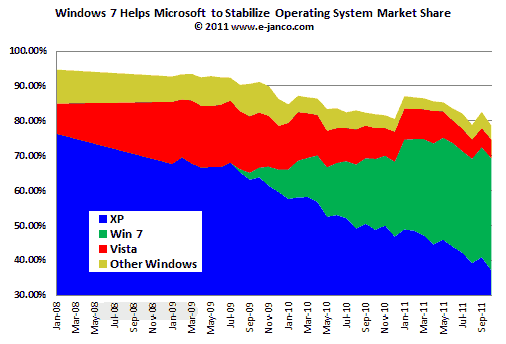 With Windows 10 in preliminary release, Microsoft is going to address the users of Windows 7 so they migrate to the new OS. This data is as of January 2015. 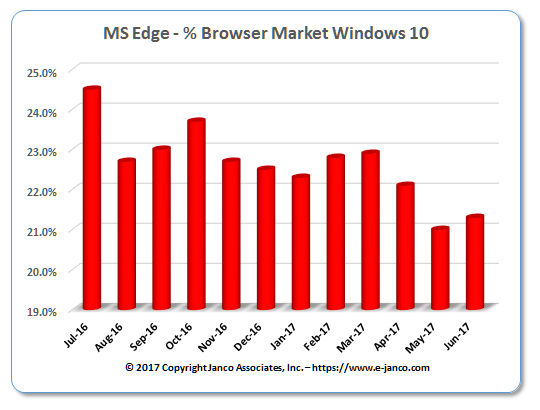 In the last several months Microsoft's browser market has continued to decay. Firefox and Google (Desktop and Chrome) continue to have the potential to eat away at the Microsoft browser monopoly and Firefox's market share. 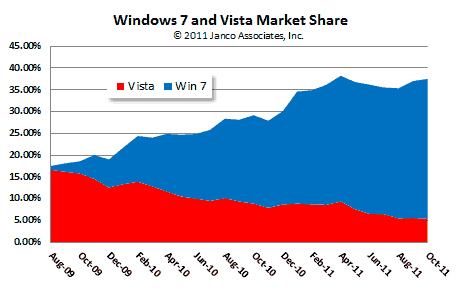 Users who move to Windows 7can more readily have multiple browsers on their systems and switch from one to the other quickly and with little pain. 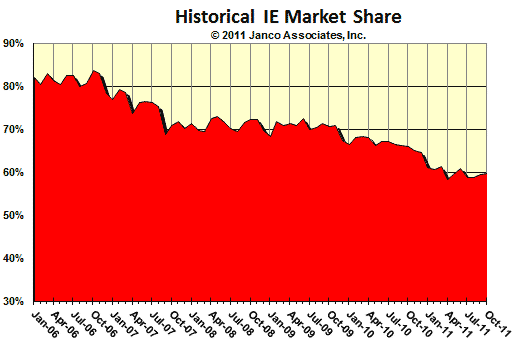 In addition with the release of the browser ballot option for the EU we forecast there will be a continual erosion of Microsoft's IE market share. Based on our test results current versions of IE and Firefox are significantly more robust than prior versions. 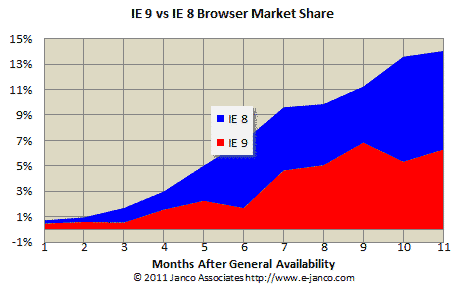 In addition, IE 9 is feature rich and a step ahead of the other browsers. Chrome has major defects which limits its usefulness on all sites. Several of these defects are highlighted in this White Paper. Adding some heat to the Browser fire, Microsoft has announced that they will be adding a spell checking feature to IE 10 which can be previewed in its Beta Version. However the acceptance of IE 9 has been much slower than prior version of the Microsoft browser. One of the primary reasons that its acceptance has been slow is the lack of a spell checking feature. 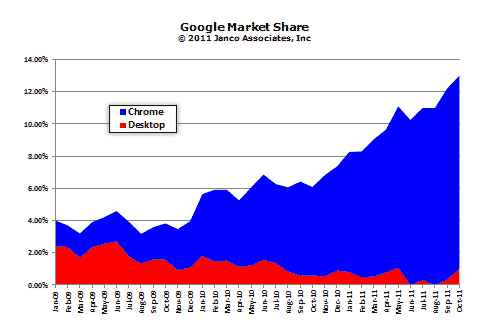 Google Chrome has taken off, while interest has waned for its Desktop product. Based on these trends we believe that Desktop will no longer be a force in browser market. 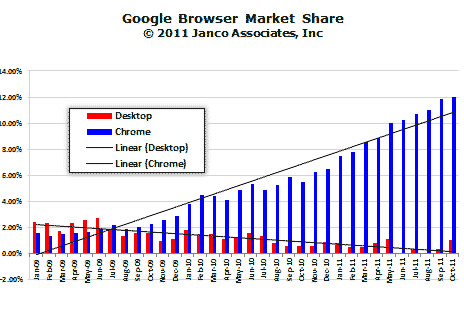 Google's Chrome offering, now commands almost 10% of the browser market and viewed by some as the browser of the future. Windows 10 is gaining market share and should have a larger install base than Windows 7 within 12 months according to some researchers. 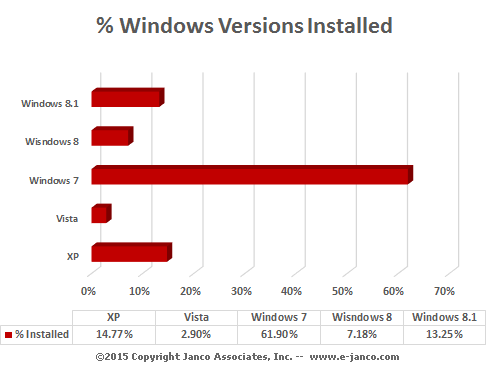 Janco has found that almost 40% of the entire OS market is taken up buy Windows 7 and Vista. 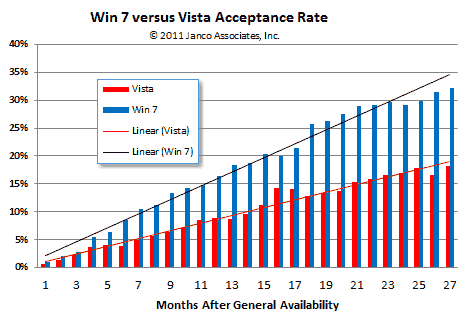 In addition, Windows 7 has a much higher acceptance rate than Vista. A full discussion of this trend as well as others is contained in the detail report. This data is updated in the full study. The data in the study is through October 2011.